Most mothers do not purposefully reject their children. In fact, if you are reading this blog, you are probably a proactive parent who looks to find ways to nurture and love your child above and beyond simply meeting their needs. 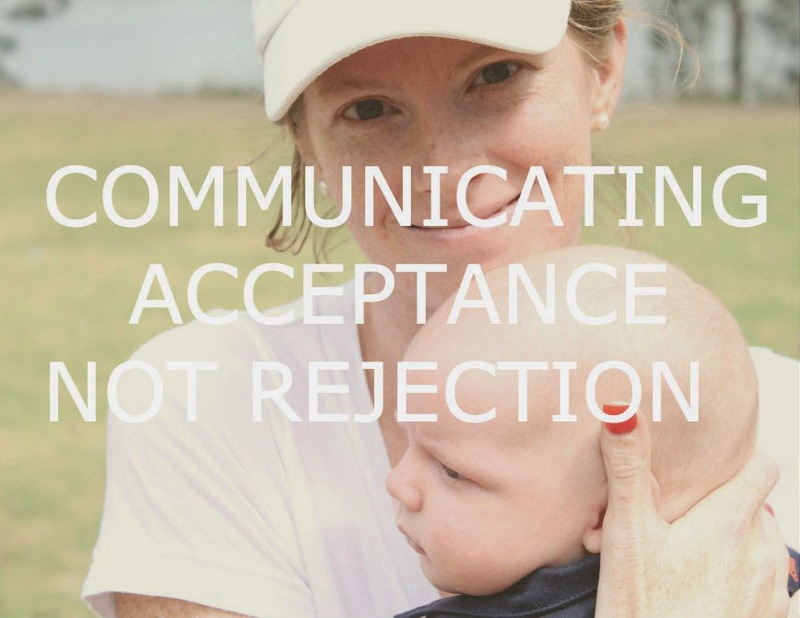 Because this is a community of purposeful mothers, and because I know you want to raise independent, thoughtful and caring children, let’s talk about how we can avoid giving our children the perception they are being rejected, even when we know they are not. If children perceive something as real, it will be real in its consequences. Simply put, if your children feel you are rejecting them (even when you are not) they will suffer its effects. Now, I don’t say this so that we become paranoid and give in to our children’s every whim – goodness no – but so we can be aware of various things that are important to the heart of a child, and be sure to respond appropriately. Here are some thoughts on how we can help our children to feel as accepted, nurtured and part of our family as we know they are. 1. Listen no matter what they’re saying. Children will go through phases where they say everything on their minds and seem to narrate each situation to phases where they don’t want to talk to you. The key to making your children feel accepted is to listen to them when they speak. I have a hard time with this if I perceive my preschooler is making no sense. However, I’ve learned that she knows exactly what she’s saying, and that sometimes I just need to listen harder. If they are emotional and seeking to communicate something to you then you flat sure need to listen. I’ve written on why it’s important that we let children tell us how they really feel, and believe every word. If they are always tattling about one sibling, watch closer. Is there some perceived unfairness? Does one child seem to dominate? Are privileges distributed unevenly? If a child is talking ‘nonsense’ about animals or monsters in the night, don’t say “honey, you know there aren’t monsters” and move on. My daughter will often ask me the same question repeatedly over the course of a few days, and I know this is her way of being reassured of the truth. The truth is (for the 1,356th time) there are no monsters, but the truth is also that she becomes scared in the night on occasion. We’ve taught her how to pray to Jesus, call for us, and tell the monster to go away. She doesn’t often need to call for us, but she does need our reassurance that she isn’t irrational, crazy or stupid for feeling how she feels. 2. Draw a line between moral and non-moral decisions. Babywise speaks of being spoilt for choice, or making sure our children don’t get too wise in their own eyes. I think this is very important, but think we must balance this with giving our children appropriate freedoms that are specific to their own personalities. If children are consistently told “no” to something they are genuinely interested in they will begin to feel rejected. Or in layman’s terms, they’ll feel as though their preferences and desires aren’t important to you. If they like to wear clothes that don’t match, then let them. To church or school? Maybe not. At home and knocking around town, why not? They don’t understand polka dots and plaid in pastels and solids don’t look great together, but they’ll eventually get it. Show you value how God made them by allowing them to do various things they want as long as they are morally sound. In fact, create opportunity where they’ll be allowed to do whatever they want. Not all day every day, obviously, but make it a point to give them free rein and show them you value their opinion. If they want to decorate their room in Spongebob Squarepants and you hate yellow then just remember, it isn’t your room. This won’t prevent them from getting into college, finding a godly spouse, or having children. It’s their room decorations. Sometimes we have to sacrifice our own preferences to make room for their opinions to shine. 3. Spend individual time with each child. The more children you have the harder this is to put into practice. Believe me, I know. While I only have 3 children, they are close together in age which prevents me from having too much time to spend on each individual child since they are all so young. I’ll try to fit in time by taking one on an errand at a time when I can. Then I’ll shower special attention on that child and try to make even a mundane trip to the grocery store feel fun. Sometimes it’s just about your child not having to fight though the family crowd to have your undivided attention that makes all the difference. Whether you take your children on dates with respective parents, rotate independent playtimes so you are alone with ones at different times, or pick child specific activities, spending individual time with your children communicates that you love the for them. Not just because they are part of the family (which they are). Not just because you birthed them or adopted them (which you did). But because you like them. You like who they are. You like who God made them. Parts of them completely outside of your control need to be accepted and praised. That’s how children feel accepted. 4. Mind you don’t have a favorite. I’ve written a whole post asking the question Do You Have a Favorite Child, but I’ll start here by saying that there is a difference in having a child that you get along with easily, and having a favorite child. I was in a room with 50 adults when we were asked to raise our hands if we grew up knowing we were not the favorite and over half the class raised their hands. Over half! This is not a laughing matter. One particular season happened a while ago and my daughter was in a difficult phase and my son was in an adorable phase. Without knowing it (and without having a favorite in my heart) I started to spend more positive time with him. After all, he was smiling. She was not. Then she started saying she was a boy. Being the genius I am I figured out what happened, started putting specific positive time in with her and it sorted itself out. Though she was too young to articulate what she was feeling, she had begun to feel that her brother was the favorite and insecurities came out as a result. 5. Guard against being present but absent. One of the most interesting and unexpected ways our children can feel rejected by us is when we are present and yet absent. I’ve written on being present but absent extensively here, but let’s get into it briefly. Being present but absent means that you are physically present yet emotionally, mentally or relationally absent. This is being in the same room as your children but ignoring them while playing on your cell phone. This is being emotionally unavailable and unable to have a real or deep conversation with our children outside the superficial. This is being too stressed or caught up in other matters to pay attention to them. Being present but absent causes a child to feel they aren’t worth your time and attention. Of course there are things in life that must get done and I’m not suggesting we focus 100% on our children to the detriment of other things. However, there needs to be time of emotional connection between our children and us. I’ve spoken with many women who grew up with both a mother and father in the home and yet suffer from “daddy issues” just as much as those who grew up without a father. Why? Because though they were physically present, emotionally they were not. Being a regular at Babywise mom, I’m sure you are already well on your way to creating a nurturing, safe, and orderly household. If you take one thing away from this post (and please don’t take away stress or fear you are secretly rejecting them even though you don’t mean to) take away this: be sure to value the God-given attributes your child possesses. When your kids know you value the parts of them that are specific to them, they will loved and accepted even though their parents aren’t perfect. What a wonderful post! These are all great reminders Rachel!